Roxicodone, also known on the street as roxies, is a semi-synthetic narcotic that is highly addictive. The painkiller epidemic among teens is plaguing the US, and the high price of Roxicodone pills has also led to an increase in heroin abuse as an alternative. Check out this informative infographic that details the who, what, how, and why on the rising popularity of roxies. Mental Illness and Addiction – A Double-edged Sword? 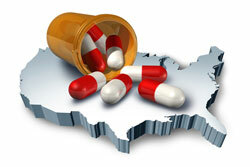 ​Mental illness and drug addiction often occur together. The Journal of American Medical Association (JAMA) estimates that 50% of people with a severe mental condition also have a substance abuse problem. It also found that 37% of alcohol abusers have a mental illness, as do 53% of drug addicts. The White House has declared prescription drug abuse to be the fastest-growing problem in the Nation when it comes to illegal drugs. Cocaine is a very powerful drug that is extremely addictive. It has many short term and long term effects, with addiction being one of the most severe. If you are showing signs of addiction, now is the time to start seeking help.